Two weekends ago it was the #sotonmeetup which was a meet up in Southampton organised by the lovely ladies Alice of Annie Writes Beauty and Amy of Amzyinwonderland. I had been so looking forward to the event but unfortunately leading up to the event a photo shoot in London came up last minute which clashed with the meet up, i was so gutted as i had been talking to all of the local girls that were going for so long but i heard that it was such a success so well done girls for doing such a great job and i will hopefully come to the next! Because i couldn’t make the event it was SO kind for Alice to keep a goody bag back for me, so i did briefly get to meet her which was so lovely! 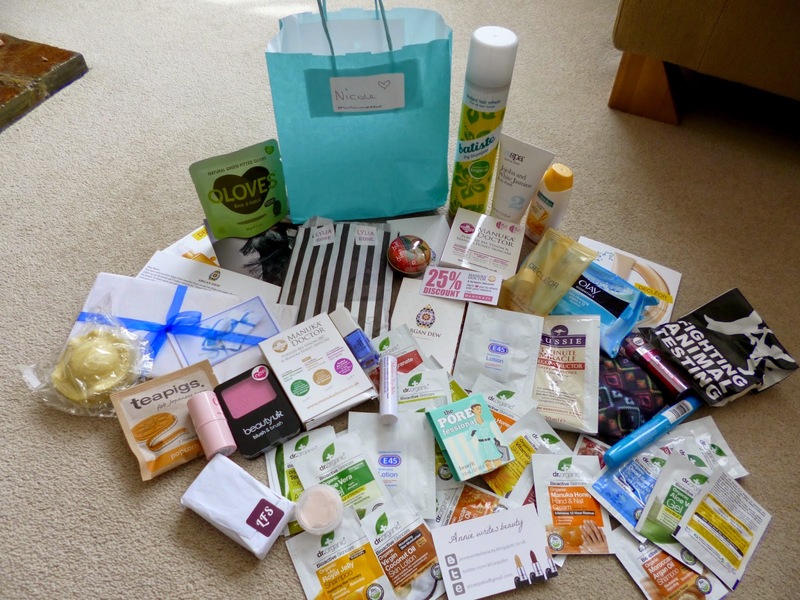 The goody bag is amazing and i cant believe how many great brands got involved, so here is a post showing you what goodies i got inside, so expect some full reviews of these products very soon! 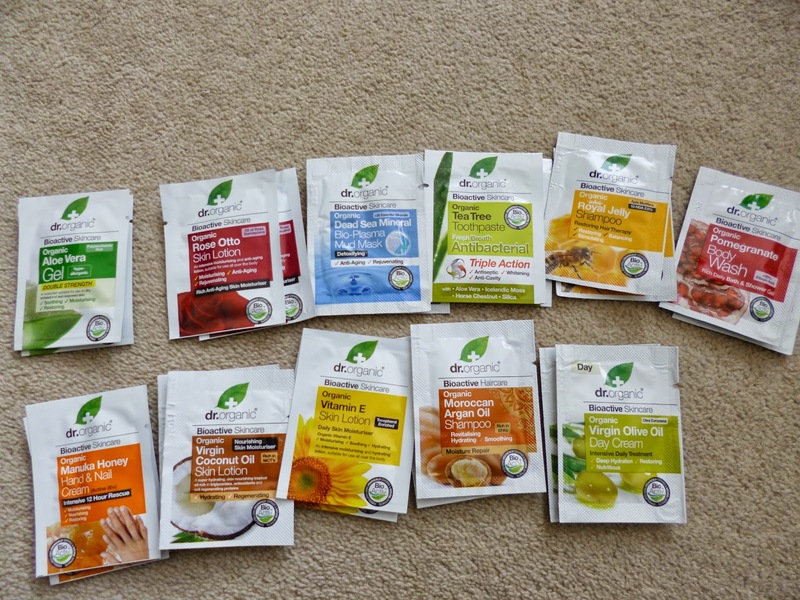 When i went to a meet up in Exeter Dr organic also supplied some samples for the goody bags and i loved them! I can’t believe how generous they were giving 2 samples of each thing. Their body lotions which i have tried before are gorgeous. I haven’t used the face mask before though so i’m really looking forward to trying it out! 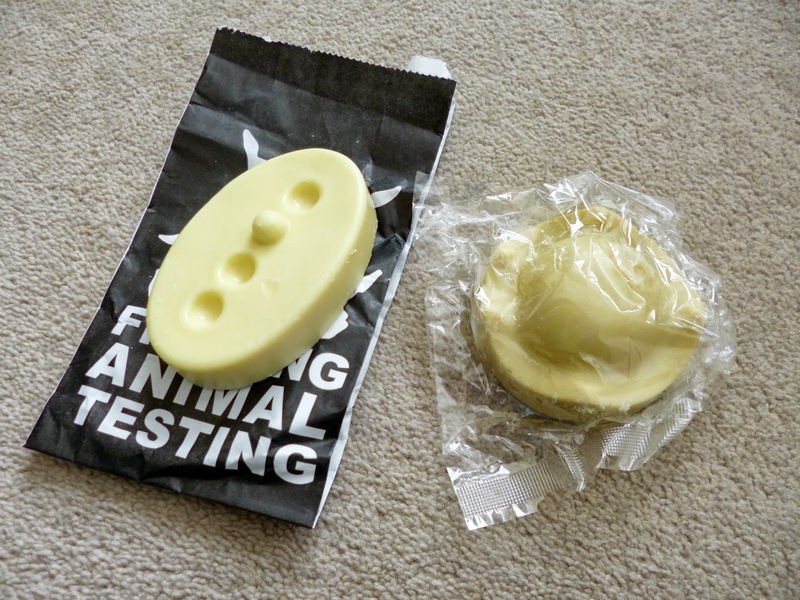 When i found these two goodies from Lush in the bag i was over the moon, who doesn’t love lush?! 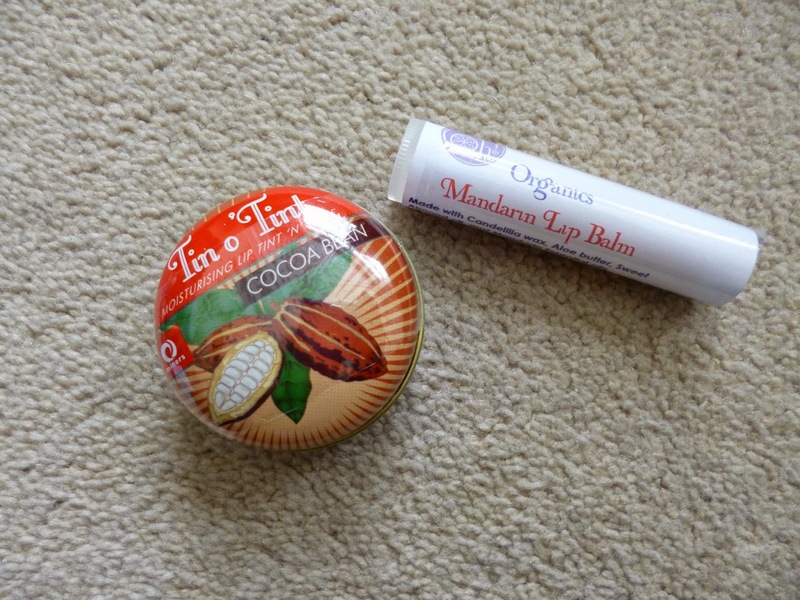 I absolutely love the massage bar which to me really smells of Terry’s chocolate orange! The bar is really oily too which makes moisturising a lovely and easy experience. The right one is also a massage bar called king of skin which is also a massaging body butter so i cant wait to see how they compare. 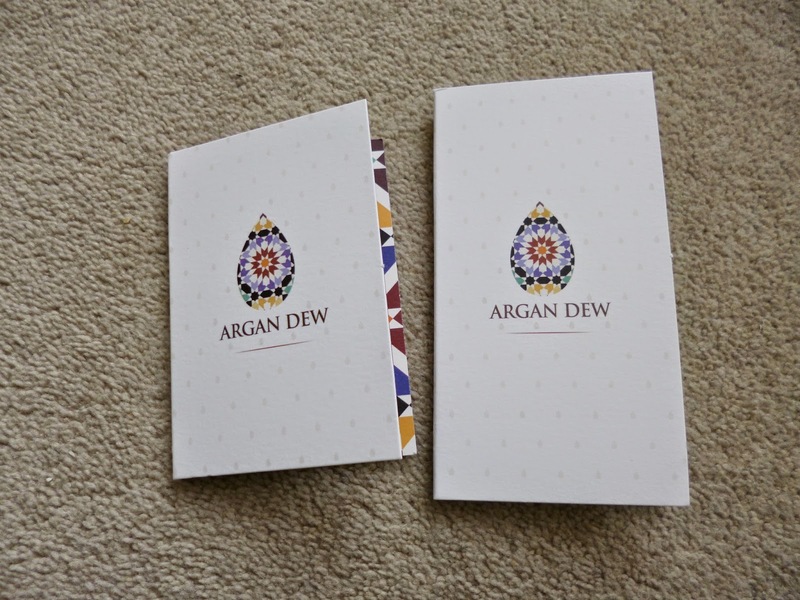 Moroccan oil has been my go to hair oil for the last year now and with it due to run out soon i cannot bare to part with £30 for it again even though its amazing so i am on the market for trying out cheaper hair oils so i am expecting good things with Argan Dew! 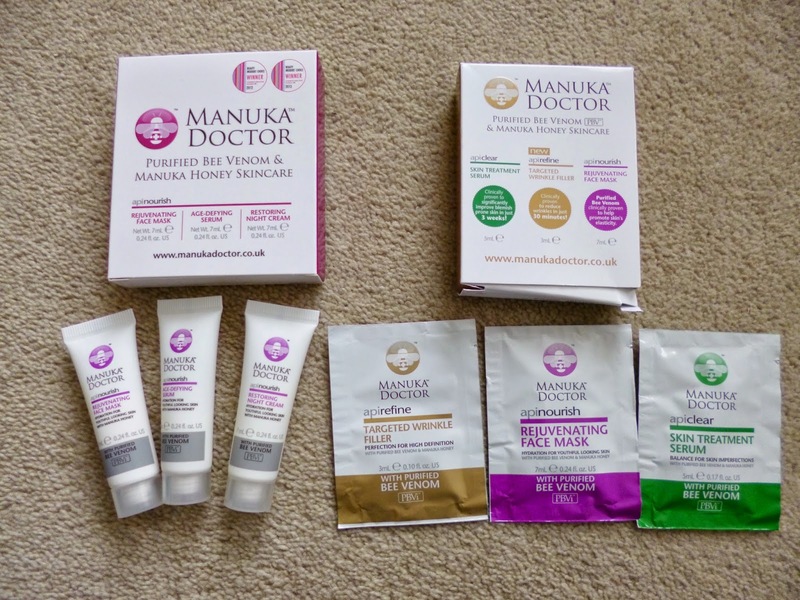 Manuka doctor is also another brand i have tried before and really enjoyed but these new products I’ve not previously tried. I’ve already passed the anti aging creams onto my mum haha im hoping at 21 that my wrinkles are currently at bay for many more years to come! I will definitely be testing out the face mask though as it sounds like it might be quite similar to the drink up origins face mask. The goody bag has basically provided me with a full set of makeup to fill a new makeup bag haha! 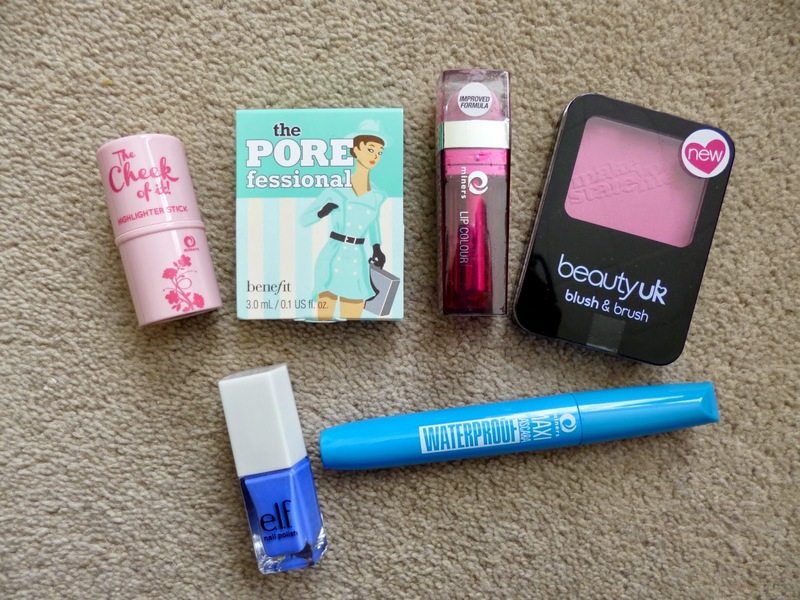 I am so intrigued to try out all these bits as they are from brands that i haven’t previously tried except for benefit. I have heard so much about Elf and how amazing and affordable their ranges are,i absolutely love the colour of this nail polish too. I’ve also been after a waterproof mascara for so long, can you believe that I’ve never owned one?! So i’m interested to see whether this will live up to its waterproof claims! A girl can never have too many lip balms right? I use mine so often that i always need another one so these will come in very handy! 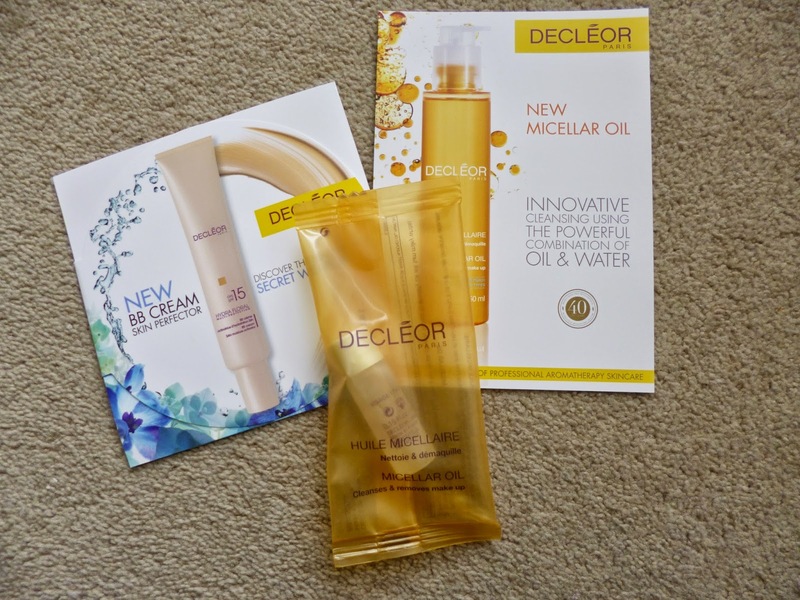 Despite micellar oils being the new fad for cleansing and removing makeup i am yet to jump on the bandwagon. I only learnt about the importance of cleansing a few months ago so i will get there eventually haha! This trial size looks great though and i will probably test this out on holiday! I love these Topshop postcards of the Kate Moss range, i haven’t had a chance to purchase anything from her range yet but whilst i’m in London this week i’m hoping to pick a few bits up! Topshop also kindly put these funky sunglasses cases into the goody bags! 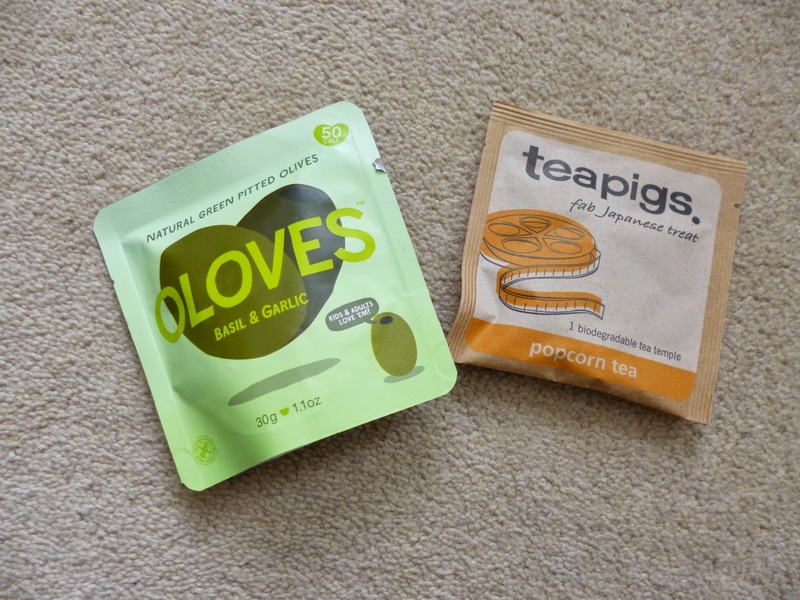 I have heard of Teapigs so much this last year and the variety of flavours on offer are amazing! Unfortunately i don’t drink tea but my family do so they will have to tell me how they get on with it. I also don’t eat olives (aren’t i boring) but the snack pack size is so cute and my dad said they tasted amazing and is already after finding some more to buy, they are such a reasonable price too. 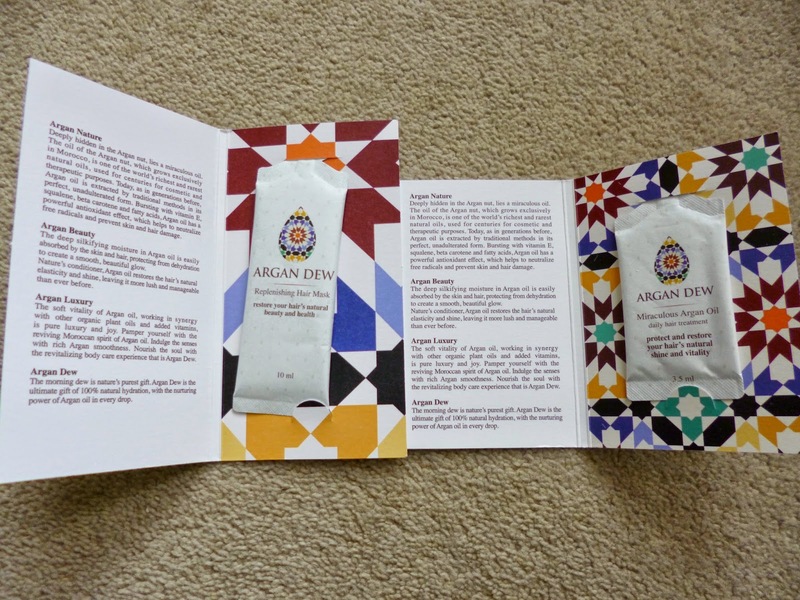 The first 3 sachets i have used and loved before, Aussie is my ultimate favourite for hair masks and they are so nourishing, a sachet usually lasts me a couple of goes too. 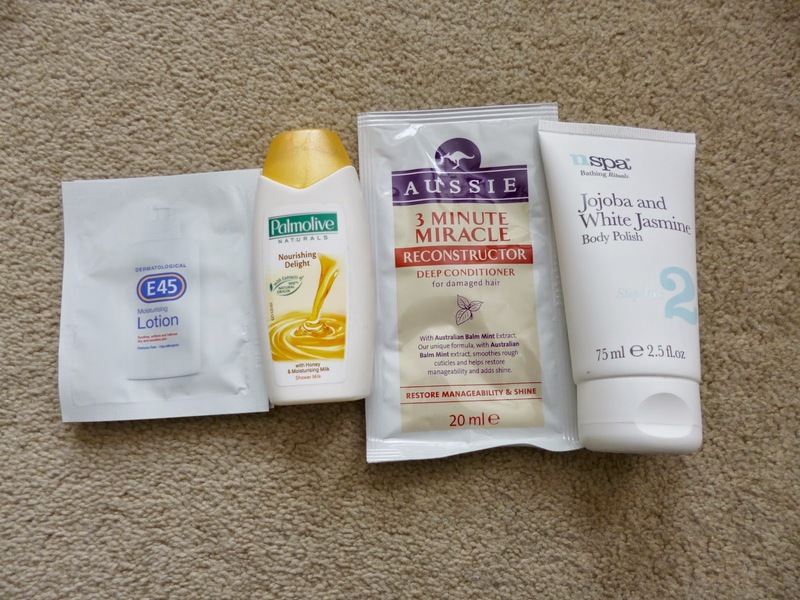 I’ve never used Nspa before but have heard very good things throughout the blogger community and for its affordable prices too. The soap is probably the prettiest one that i have ever laid eyes on! The mixture of the colours is beautiful and the smell is incredible! This one in particular is a lavender and peppermint one, i really don’t even want to use it because it looks so nice and at only £3.95 its a cheap way to make your bathroom sink look super pretty at the same time. The body shop also provided a small sample of peach butter which as i’m sure you all know they sell the nicest smelling body butters! The Olay face wipes will always come in handy when i’m travelling too, i’m far too lazy to do the full cleansing routine when i’m away! 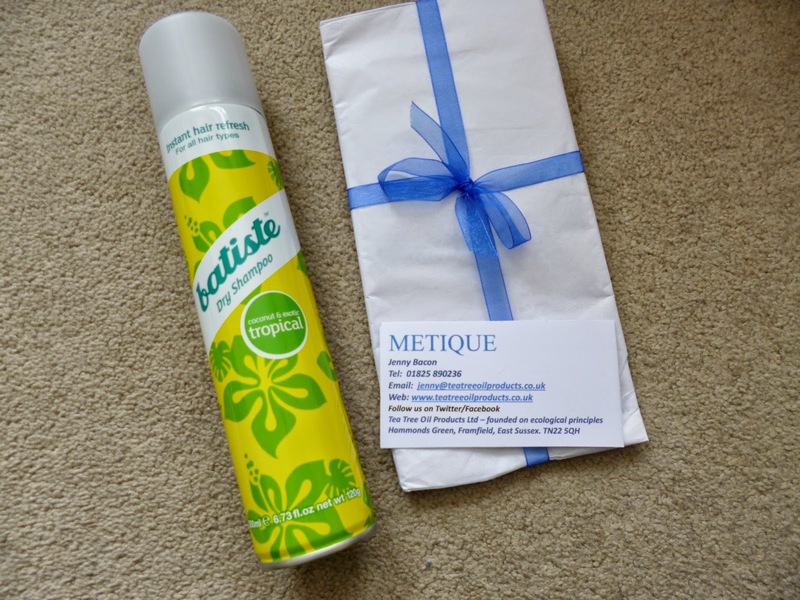 I think most girls are a fan of dry shampoo and i always have a can of batiste at hand! Because my hair is so long i really cant face the effort of washing it all the time so dry shampoo is an essential! Its also a necessity for upcoming festivals. The fact that these products are all completely natural is really good to know as its crazy how many bad chemicals we put into our skin daily without knowing. 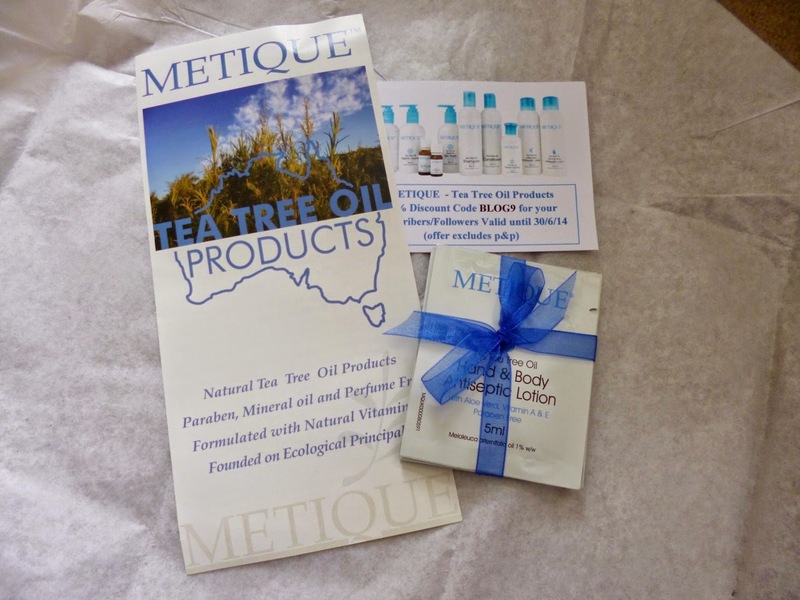 Tea tree oil is known for its great healing benefits too so i’m certain these will be lovely! 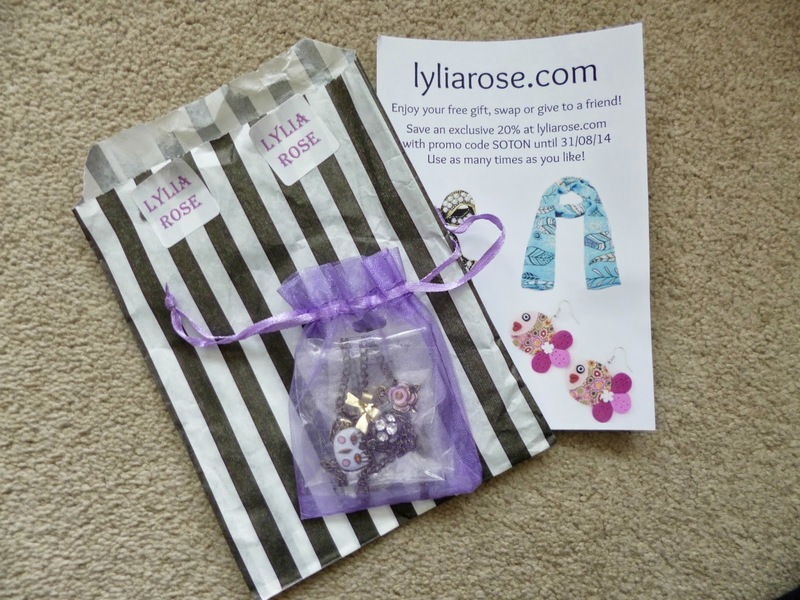 I’ve followed Lylia Rose on twitter since i began blogging and have always admired her stuff. She sells really pretty and quirky jewellery and at really reasonable prices. I absolutely love the little necklace that we were gifted and the wrapping is gorgeous! Congratulations if you made it to the end! What do you think of the contents? 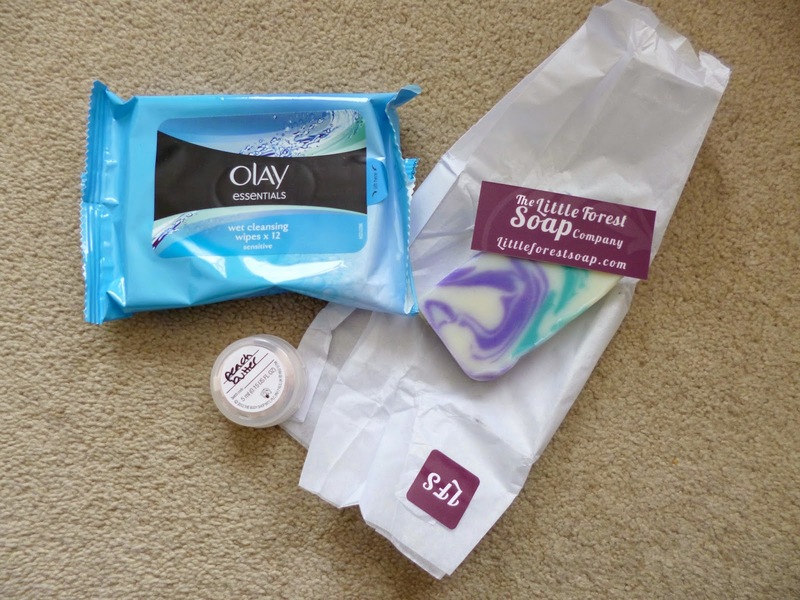 Have you tried any of these brands before? What would you like to try?